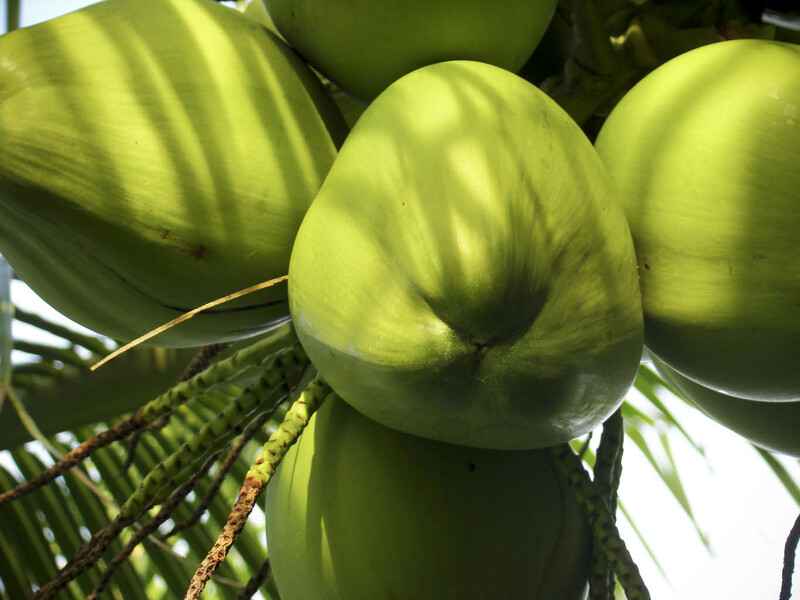 The origin of the coconut is virtually unknown. The coconut palm may have originated in the lands around the Western Pacific; from there it was probably distributed east- and westwards by early peoples. Ocean currents also dispersed it, with the seeds protected by the fibrous fruit. Germinating coconuts were found washed up on the shores of the newly born volcanic island of Anak Krakatoa, in the 1930s. The three 'eyes' of the coconut represent the three eyes of the great god Shiva . The palms are also frequently mentioned in the early Tamil literature dating from between the 1st century AD to the 4th century AD. Coconuts feature in the Hindu epic stories-, the Ramayana, the Mahabharata and the Puranas. According to Indian mythology, coconut tree was created by the powerful sage Vishwamitra to prop up King Trishanku who was attempting to gain entry into heaven as a mortal but was thrown out by the gods. It seems to have been adopted quite late into Aryan rituals, and north Indians may have become familiar with the nut long after it was used in the coastal south. Coconut became known to the western world in the 6th century. It was imported into Egypt from the Indian Ocean. Marco Polo recognized the coconut as the "Pharoah's nut" as he traveled through India. In the mid-sixteenth century sea-faring traders introduced the palm into Spain and Portugal, Brazil and Puerto Rico. Spanish sailors to describe the monkey-faced appearance of the coconut might have coined the name ‘coconut'. Coconut (Cocos nucifera) is a monocotyledon belonging to the order Palmae. It is the sole species of the genus Cocos. 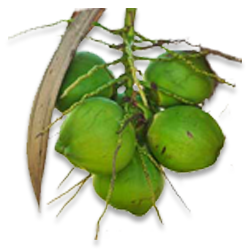 (Cocos = monkey face, nucifera = nut bearing) Trees are generally unbranched, erect, cylindrical, pillar-like stem reaching up to 25-30 m in height. Trunks may reach a diameter of 50 cm. The trunks are ringed with scars where old leaves have fallen. The top of the trunk is crowned with a rosette of leaves and a branched inflorescence enclosed in a sheath collectively known as the spadix. The stem is usually unbranched, light grey, smooth and erect or slightly curved Stem rises from a swollen base, the bole. Growth of stem originates from one terminal bud in the center at the top of the stem. The first years after germination, only very short internodes are developed from which sprout many adventitious roots. Only when the full width of the stem has been reached (after 4 years for talls and 2-3 years for dwarfs) elongation of the stem begins, and the stem emerges from the ground. As the stem has no outer cambium it does not grow laterally and wounds in the stem will always remain visible as they will not be covered by new growth. Steps cut into the stem for climbing will remain for as long as the palm lives. Under normal conditions, the stem diameter remains the same. Under unfavourable conditions the diameter of the stem will decrease. The branching of stem results from slight damage of the growing point, or from severe stress . The stem consists of a central cylinder surrounded by a narrow band of tissue, the cortex, called 'bark', about 1 cm thick, somewhat thicker at the base of the stem. The central cylinder consists of a parenchymatic tissue enclosing vascular and fibrous bundles. The vascular bundles at the centre are more widely spaced than at the periphery. The surface of the cortex shows a pattern of triangular-shaped leaf scars, marking the stem where former leaves have been attached. Between the leaf scars there are unscarred areas, the internodes. The distance between the leaf scars shows the growth rate of the palm. For instance, if a coconut palm produces about 14 leaves per year, the total distance between 14 leaf scars represents 1 year of stem growth. Every tree has a rosette of leaves at the top of the trunk consisting of opened leaves and those in the bud in various stages of development. The length of a leaf depends on variety, growing conditions and age of the palm. It may reach up to 7 metres in tall palms, with a leaf area of up to about 10 m2, and weighing up to 20 kg when green. Leaf primordia are differentiated about two years before appearing as a central unopened spear. The phase of elongation within the spear takes about 6 months and mature leaves may remain on the palm for about three years, sometimes even longer. The total number of unfolded leaves usually varies between 30 and 40, depending on growing conditions and variety. Mean annual leaf production is about 14-16 for mature tall palms and 21 for dwarf palms. All leaves originate from the growing point at the apex of the stem. The youngest leaves are folded and wrapped together. They form the central spear, or heart of the palm. The central cylinder of the spear, is white and soft. It is considered as a delicacy and is called 'millionaire's salad'. From the spear, the leaves gradually unfold and expand. They are arranged in spirals, running clockwise in some palms, anti-clockwise in others. The crown of a mature coconut palm growing under favourable conditions forms an almost full sphere. The oldest leaves are found in the lowest whorls, and a few withering leaves may hang alongside the stem before dropping. The length of the petiole is about one-quarter of the total leaf length, but the ratio differs with variety. The petiole continues as the mid-rib of the leaf. Weak leaves may collapse by the weight of heavy fruit bunches resting on the leaf stalk. The petiole is attached to the stem by means of a sheath in the form of a bracket firmly clasping the stem with its wings almost around it. The leaflets growing out from both sides of the mid-rib have different lengths. The first leaflets at the base are short, the following leaflets gradually increasing in length, reaching a maximum of about 130 cm at about one-third of the mid-rib, gradually becoming smaller again towards the tip of the leaf. The smallest leaflets at the tip may be only 25 cm long. The longest leaflets of dwarf palms may not be longer than 80-110 cm. Length and width of leaflets vary with variety. The total number of leaflets of a mature palm leaf varies from about 200 to 300. Thick cuticles cover the leaf blades. The lower epidermis is thinner than the upper epidermis. Stomata are located in the lower epidermis. The inflorescence of the coconut palm is a spadix that develops in the axil of each leaf. Thus, the number of leaves produced annually also determines the number of spadices developed. Initiation of the spadix begins about 33 months before its opening. Differentiation of the sheath takes place about two years before its opening and differentiation of the spikes about six months later. Flower primordia are initiated about one year before opening. Before opening, the spadix has a spear-like shape, with a length of about one metre. The inflorescence is enclosed within the sheath, branches or spikes of the inflorescence lying close to the main axis. When the inflorescence develops within the sheath, the latter finally splits open over its entire length, about three months after its appearance, the inflorescence emerging and unfolding. The spadix consists of a main axis with 20-65 branches, or spikes, bearing flowers. Female flowers are located at the base of the spikes, the rest of the spike being fully covered by male flowers. These flowers are sessile. Each spike may have one or more female flowers and generally about two to three hundred male flowers. The total number of female flowers per inflorescence usually varies between twenty and forty. Dwarf palms generally carry a higher number of female flowers in the spadix. There is a great variability in this characteristic which, apart from being determined genetically, is also strongly influenced by growing conditions. First spadices usually have fewer female flowers per inflorescence than spadices in mature palms. Palms producing large nuts usually have fewer female flowers than palms producing smaller nuts. Abnormalities, such as inflorescences with only male flowers also occur. Coconuts are large, dry drupes, ovoid in shape, up to 40 cm long and 30 cm wide. The exocarp or skin is green, yellow, or bronze-gold, turning to brown, depending on cultivar and maturity. The mesocarp is fibrous and dry at maturity; the product coir is derived from this layer. The endocarp is the hard shell enclosing the seed. Seeds are the largest of any plant, and have a thin brown seed coat. Seeds are filled with endosperm, which is solid and adherent to the seed coat, and also in liquid form. Copra is derived from the solid endosperm. The seed has 3 germ pores in the proximal end. Two pores are generally plugged, and the embryo lies beneath the third functional pore. A "blind coconut" has all 3 pores plugged. The embryonic root and shoot emerge through the functional pore, while the cotyledon forms a spongy mass of tissue within the seed cavity, absorbing the endosperm, which fuels initial growth. Seeds germinate within intact coconuts, and for up to a few months, young palms can remain rooted within the mesocarp. Dwarf cultivars are precocious and begin fruiting in 3 years, whereas tall cultivars require 6-10 years. Fruit require about one year to mature. Being a monocotyledon, the coconut has no tap root. Adventitious roots develop from the bole. The first root is developed at germination and may reach a length of about 5 cm in the first week of growth, during which time also one or more rootlets may have developed. Rootlets are produced in quick succession, radiating in all directions, and breathing roots or pneumatophores are also found on the first root. The second root is formed about 10 days after the first. Six weeks after germination, when the shoot becomes visible above the husk, the seedling may have three roots, the longest measuring about 20 cm. Under conditions of high humidity and wounding of the stem, roots may also develop from the stem above the bole, even at great height. When covered with soil, these roots grow out normally and develop secondary roots and rootlets. Old roots die and new roots develop continuously. The number of primary roots increases with the age of the palm. The total number of primary roots depends on the variety and health of the palm, as well as on soil conditions such as fertility, humidity and cultural practices. Primary roots are about 1 cm in diameter and of uniform thickness. There is a continuous production of secondary roots. The root colour varies from almost white at the growing point through cream colour to scarlet, brown and dark brown on the oldest part. This process takes about 15 years. The roots have no root hairs. Their cortex is covered by a thick, hard impervious layer, the hypodermis , which does not allow penetration of water or air. Water and minerals are absorbed only in the white zone about 2-5 cm behind the tip of the root. The tip is covered by a root-cap.